Get ready to hit the ground running in Import/Export – coming soon to GTA Online – and to better assist CEO’s to prepare, we’ve tailored this week’s bonuses toward getting the gear you need faster. 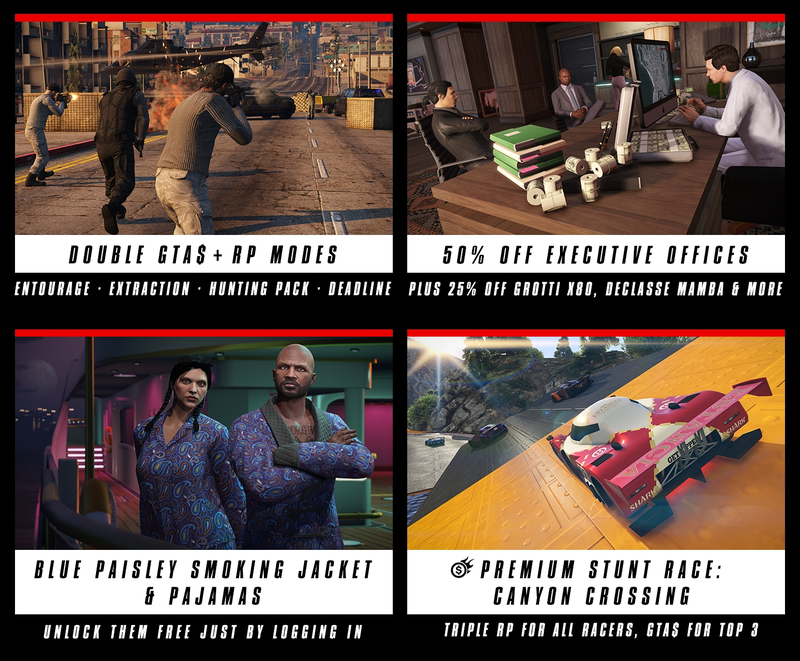 Get Double GTA$ & RP on a host of game modes, discounts on key items from Executives and Other Criminals and Further Adventures in Finance and Felony including 50% off Executive Offices to run SecuroServ operations and more. Starting today, team up to protect the Executive Target and earn Double GTA$ & RP in Entourage, Extraction and Hunting Pack. Also earn Double GTA$ & RP in Deadline as you hop on your Shotaro and utilize power-ups to obliterate foes with your light trail. On edge after a tense match of Deadline? Take a load off and slip into something more comfortable like the Blue Paisley Pajamas and Smoking Jacket, available for free just by logging in. 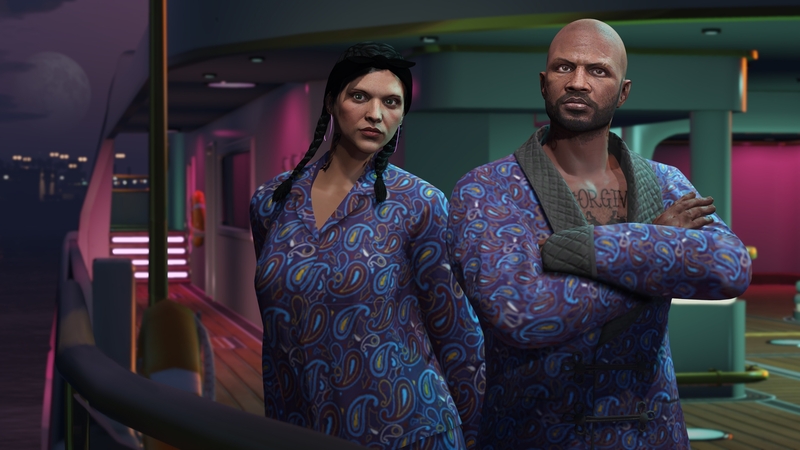 Head to any clothing store in GTA Online and claim these relaxing threads in time for the holidays. White water rafting is for cowards. Strap inside your Annis RE-7B or Emperor ETR1 and plunge through tubes suspended above Raton Canyon at breakneck speed. 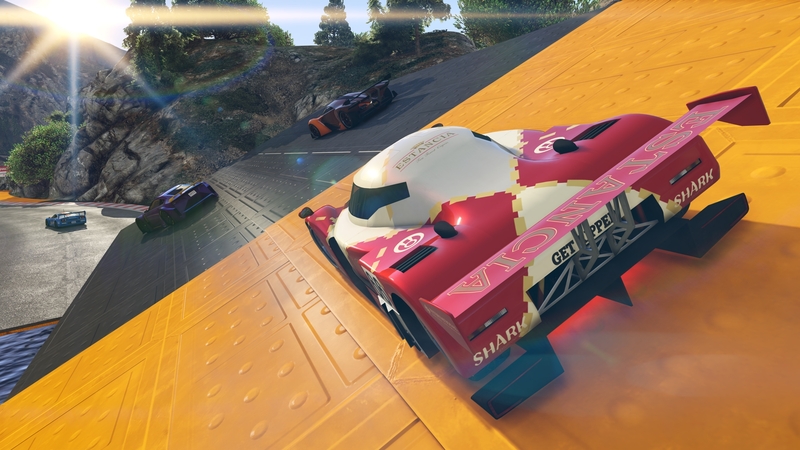 Locked to the Super class and set to Non-Contact, all participants earn Triple RP with substantial GTA$ prizes for the top three finishers. To access the Premium Race, enter the yellow blip at Legion Square or via the Quick Job App on your in-game phone today through December 12th.